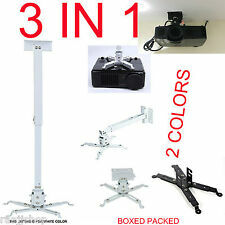 New Chief 36" Fixed Extension Column Projector Mounting Pole CMS036W NPT 1.5"
Fully extendable. can be use for ceiling or walls. Adjustable, tilt forward backward sideways. Perfect and stylish wall/ceiling mount. mat finish black and white colour. COMPATIBLE WITH ALL FAMOUS MOUNT. Fully extendable. can be use for ceiling or walls. Adjustable, tilt forward backward sideways. mat finish black and white colour. Perfect and stylish wall/ceiling mount. COMPATIBLE WITH ALL FAMOUS MOUNT. When a ceiling mount won't work for your needs then use this wall mount to get your projector installed. 3-in-1 Design : you can use this as a wall mount or ceiling mount. 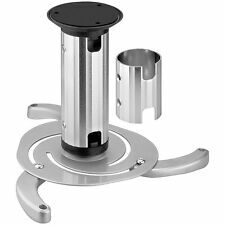 The ceiling mount can be used with or without the extension arm. 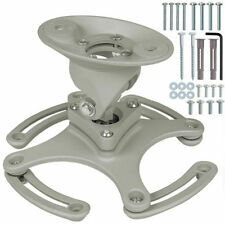 Luxburg Universal Ceiling Aluminium Projector Mounting Bracket Kit holds 15kg 30 degrees tilt - White. All unwanted cables can be easily hide inside the mount mount can be tilted 30 degrees in four directions. 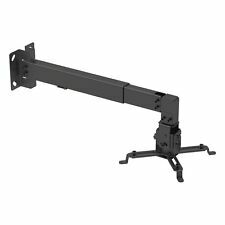 Universal Mounting with four fully adjustable and extendable swing arms to accommodate various mounting patterns. Fits projectors with mounting holes up to 11" apart. If the distance is less than 11" then this mount should work. 2 Spare Thumb Nuts. 1 Mount with Installation Instructions. These are previously used mounts that are in excellent condition. Maximum load capacity: 22lbs. Ceiling to the projector: 5.9". Fits projectors with mounting holes up to 11" apart. If the distance is 5.5" or less to each hole then this mount should work. Projector Mount. Designed to keep your projector safe and steady while blending perfectly into the surrounding room, you won’t find a better solution to your projector needs. Easily mounted either on the wall or ceiling, Easy to install. Simply use this pole in conjunction with a LINDY projector bracket and attach your projector to either a ceiling or a wall. For use with either the LINDY Box Type Projector Bracket (Lindy part No. 40848) or the X-Type Projector Bracket (both not included). 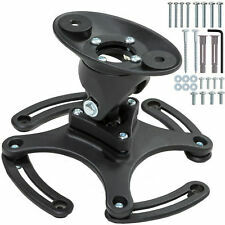 Genuine Boss speaker bracket in black. Ultra-Short Throw Wall Mount (ELPMB46). And, when your ultra-short throw projector is attached to the wall mount, there is less shadow interference and glare, which ensures a more optimal presenting and viewing experience. The ExtronZipClip 200 mounting kit provides quick and flexible installation options for eighth-rack and quarter-rack width, 3" and many 6" deep Extron products. This Patented two-piece kit includes the ZipClip 200, which mounts easily under a table, on a shelf, or to a rack rail, and the ZipCaddy™ 200, a secure mounting platform for one or two Extron products, depending on size. The OCM818B Black Universal Projector Pole Mount is ideal for high ceilings. It’s the perfect universal projector pole mount. - Quick projector reconnect/ disconnect. - Vaulted and cathedral ceiling compatible. High quality mount with loading capacity up to 44lbs. 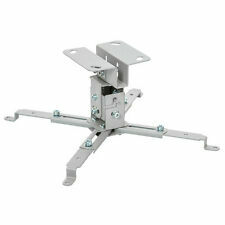 Adjustable Tilt Swivel LCD/DLP Projector Ceiling Mount Fits Flat or Vaulted Ceiling. The projector ceiling mount is attractive, strong and light weight. This ceiling bracket is perfect for mounting most any projector to the ceiling. 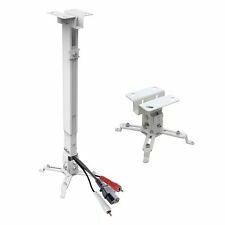 It has a 30 degree up and down / Left and Right tilt and adjustable folding extension arm allowing you to position the projector perfectly for your application. 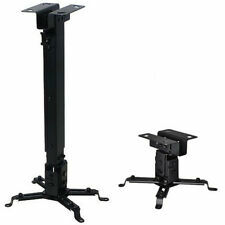 Adjustable Tripod Laptop Projector Stand 28" to 46". Device / Shelf Plate Size: 16" x 20" (Engineered ABS) - Sturdy Tripod Legs. This professional DJ laptop stand is great for mixing it up at gig. Easily adjust the height from 28" to 46", then tweak the angle for maximum comfort and mix ability. QualGear PRB-717-WHT is the latest addition to projector mounts category. Low profile flush mount; Holds projector at 6" from the ceiling. Tilt: 0 to 60 degrees. Swivel: 360 degrees. Roll: /-20 degrees. Neuste Version der elpmb46 Halterung. Professionelle Originalqualität. Nicht zu vergleichen mit Chinahaltern aus dünnem blech die sich unkontrolliert im alle Richtungen biegen. Auch für Optoma (FullHD) Projektoren nutzbar mit EWMA2000 Adapter (z.B. von Computeruniverse für 34,-). Get Full HD 1080p with exquisite, enhanced detail. And, with wide vertical and horizontal lens shift and 1.6x zoom lens, positioning is easy and flexible. The PortaCom H-2000LT Lightweight Headset with Mic for Wireless Intercom Systems features a female 4-pin XLR connector and is compatible with ProLink wireless intercoms. The integrated mic is on a flexible boom that can also be adjusted for height. This projector lifter is used at school, assembly room and another. Range 39In (1M). Projector Lifter 110V. · Out size of the projector could not bigger than 20 20In(50 50Cm). ·The weight of the projector could not than 22Lb(10Kg). The PRB-18M is a universal ceiling mount for projectors up to 13.5kg/29.7bs. Tilting ceiling plate for flat and sloping ceiling application. ● Adjustable Ceiling Plate: for mounting in flat or sloping ceiling. 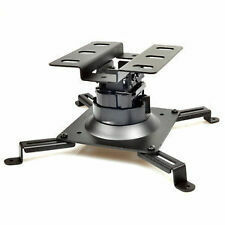 UNIVERSAL CEILING MOUNT FOR PROJECTORS UP TO 25KG / 55LBS. PROFILE 135MM (5.3"). SUPPLIED WITH FIXINGS M3X25/ M4X25/ M5X25/ M6X. 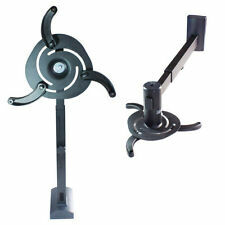 Versatile - Features 15 to -15 degree tilt (pitch) and dynamic 360 degree rotation (left to right). Projector mount. This projector lifter is used at school, assembly room and another. ·Out size of the projector could not bigger than 49x49cm(19.3x19.3 ″ ). ·The weight of the projector could not than 22Lb(10Kg). Projector Lifter. WP23S - CHIEF SHORT THROW PROJECTOR WALL MOUNT, 56" EXT. Also supports wall-mounted long-throw projectors. Ability to personalize your install with Chief's interchangeable logo card. Short Throw Mount (56") Ext. Lateral shift of 1.75". Designed for mounting to concrete, block wall, brick, dual wood or dual steel studs. PIEDISTALLO PER TV SAMSUNG T24E390EI LT24E390EI/EN. PRIMA DI ACQUISTARE ASSICURATEVI CHE LA BASE SIA COMPATIBILE CON LA VOSTRA TV. PER QUALSIASI INFORMAZIONI O PROBLEMA NON ESITATE A CONTATTARCI! LEGGETE BENE PRIMA DI ACQUISTARE. Setup your device and mount it where necessary -- quickly & easily. Locking clamp-style fasteners are hassle-free which also enable compact folding and portability. 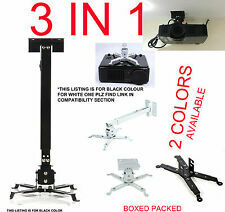 Video Projector Mount Stand Adjustable Height Swivel/Rotating Plate Tripod Style. Die beschichtete, aus leichtem Aluminium gefertigte Ausführung lässt sich unproblematisch an nahezu jede Decke montieren. Die Deckenhalterung ist zu allen Seiten bis zu 25° neigbar. Deckenkonsole: ca. 130 mm x 72 mm. Brackets included: CANGKE281WJ31. No screws. Compatible with Sharp LC-60LE660U, LC-60LE661U ,LC-70LE660U, PN-LE701, PN-LE601. The Prox X-TR1912 MK2 is the latest Laptop/Projector Tray for a tripod or speaker stand. ProX X-TR1912MK2 Laptop Projector Tray Features (1) ProX X-TR1912MK2 laptop projector tray holder for tripod stands. Versatile - Features 15 to -15 degree tilt (pitch) and dynamic 360 degree rotation (left to right). Projector mount. Convenient - Mounting hooks allows you to attach or detach the projector safely and easily. This stand will not hold a short-throw projector. Fits 77" – 87" SMART Board interactive whiteboards. (does not hold a short throw projector). NEW, Factory sealed Floor Stand! Height-adjustable mount automatically locks in position.